Mini golf has long served as the fun and accessible answer to its more serious counterpart – can we say ‘real golf?’… ‘regular golf?’ – well, golf. We recall playing it as a small child, but are now reminded of our awkward full-grown adult stature as we hunker over our putters and our shots are compromised by castles and plastic animals. 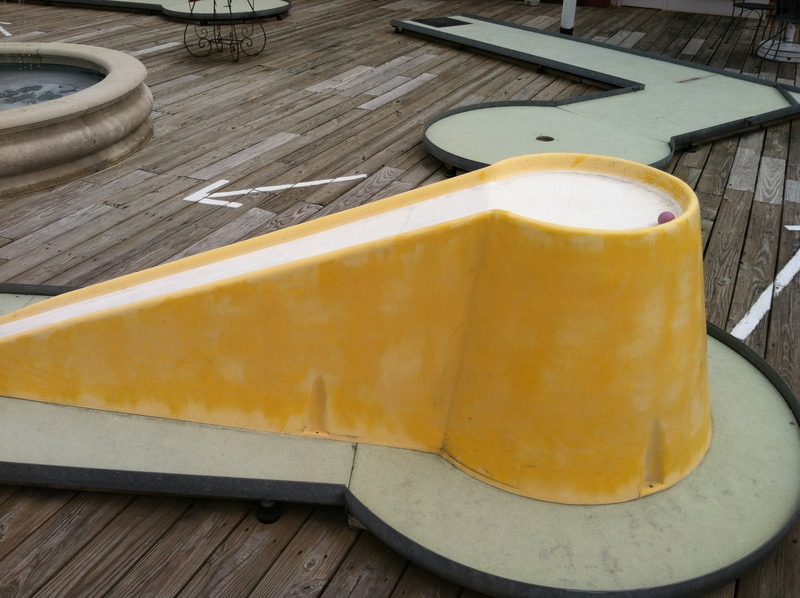 While we can all appreciate the kitschy aesthetic of mini golf courses, their obstacles and inhabitants, mini golf has also seen a rise in recognition from contemporary institutions, including our own Walker Art Center, who has been partnering with local artists on their courses’ design and creation since 2004. So what is the connection between high art and lowbrow sport? Writer and historian Jonathan Haeber would convince us that, “like art, the design of a course changes in the realm of time, and attracts the people of its age. 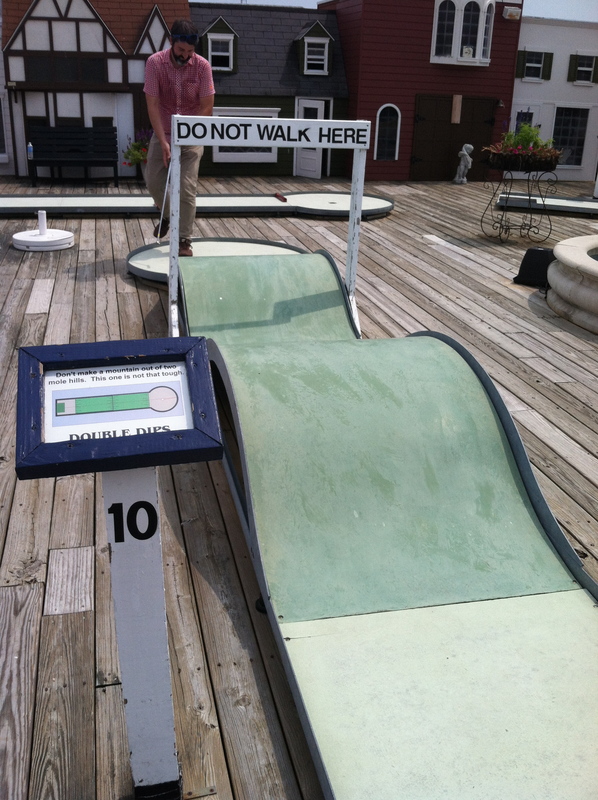 Like cinema, miniature golf is a variant of art for the masses. It is the greatest unknown art of the American landscape and its artists are the [sic] craftsman that satiate the lower and middle class of their appetite for culture,” states, Haeber, who goes on to support his claim with how various stages of miniature golf course design corresponds with traditional movements and figures in art. The Walker Art Center, along with partners mnartists.org, will continue this legacy of art for the masses by working with local artists for another summer of Artist-designed mini golf, opening summer 2013 in the midst of the Minneapolis Sculpture Garden. While each hole has a par, what makes one hole or a course ‘good?’ Does this ‘art of the American landscape’ have aesthetic criteria? What should artists think bout when crafting their proposals? I sit down with Tom Loftus and Robin Schwartzman, a.k.a. 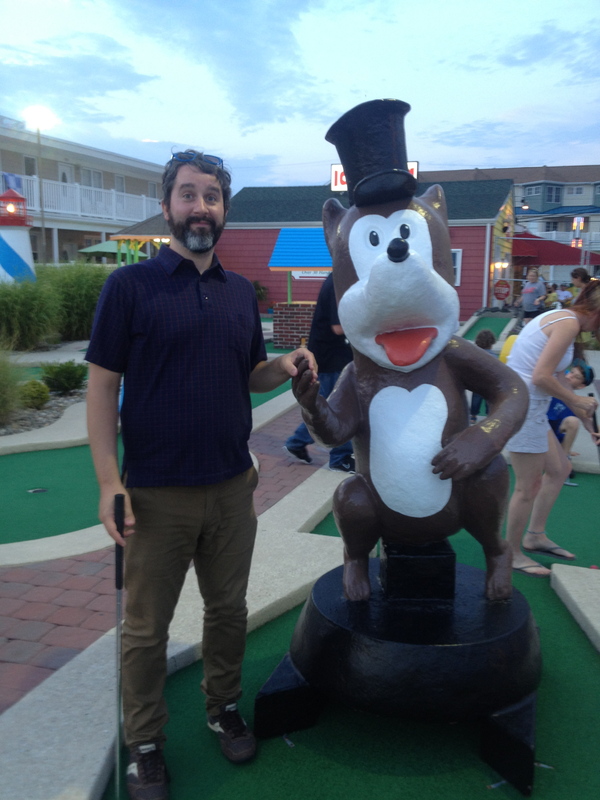 Mr. Tee and the Pink Putter, of A Couple of Putts, a blog dedicated to charting and rating mini golf courses across the United States, to learn more about the aesthetics of mini golf. How long have you both been playing mini-golf? Boy, I’m not sure. Maybe 30 years? It was a fond childhood memory that I can’t put a year on, but I can say I have played since I was a “kid”. We would play every year on family vacations to the Jersey Shore and around eastern Pennsylvania, where I grew up. My dad always made my sister and I hold the clubs properly and he would count every stroke penalty, so we took the game pretty seriously. I’m not sure how old I was when I started, but it has been a long time. You guys are not just your average enthusiasts, I would call you connoisseurs! How many courses have you played? We’ve played about 40 courses each. Both of us know the courses from our respective states and surrounding areas. I grew up in Minnesota and played a number of courses that don’t exist anymore. Mini-golf was a bigger deal in the 80s and I would play at camping sites and various amusement centers. The local options are much more limited these days. You’ve both also been to mini golf courses all over the United States. 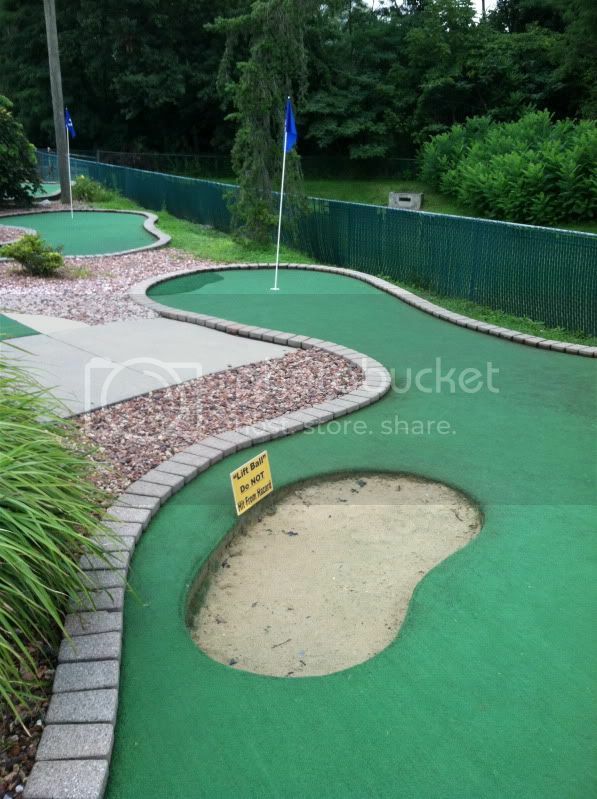 Are there areas where mini golf thrives more than others? 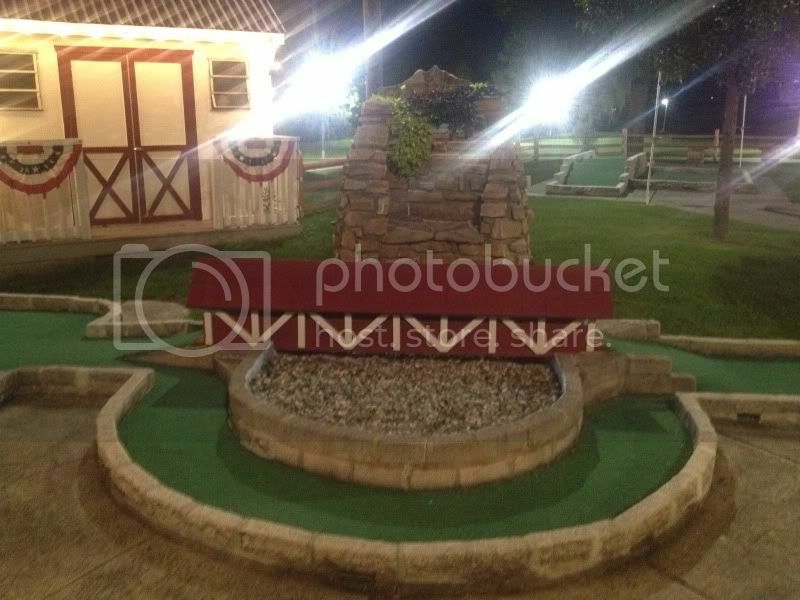 Mini-golf is definitely most popular in warmer climates and dense tourist areas (i.e. Wisconsin Dells, Jersey Shore, Orlando). 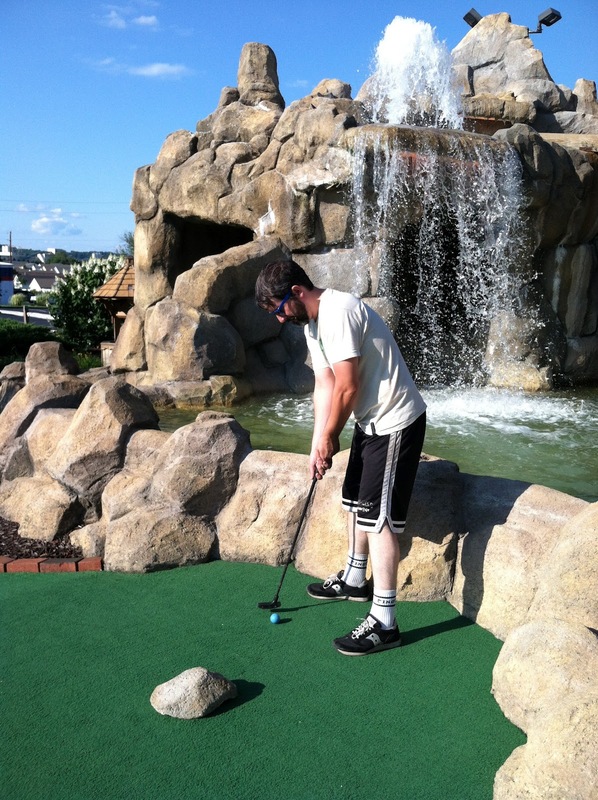 The mini-golf capitol of the US is Myrtle Beach, S.C. They have about 50 courses there and we’re planning to visit soon. What are some of your most memorable holes? 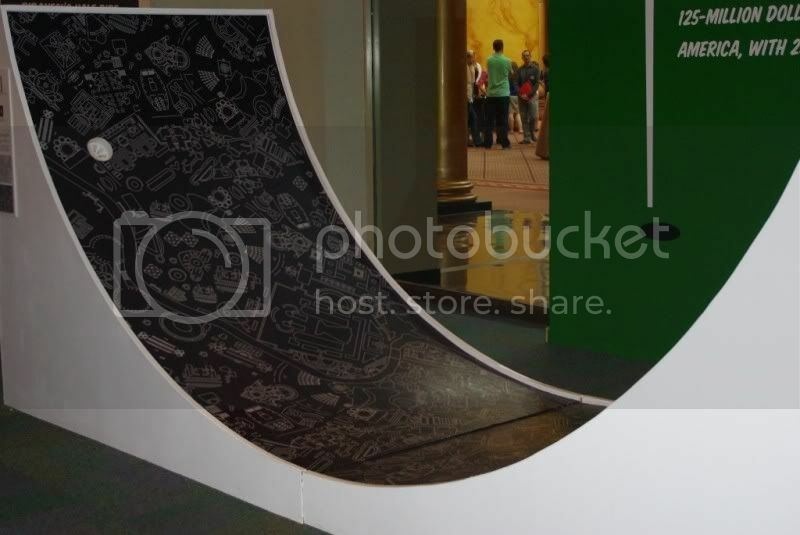 The Half-Pipe “hole” at the National Building Museum course was one of the wildest holes I have played to date. I never actually got the ball in one of the holes. 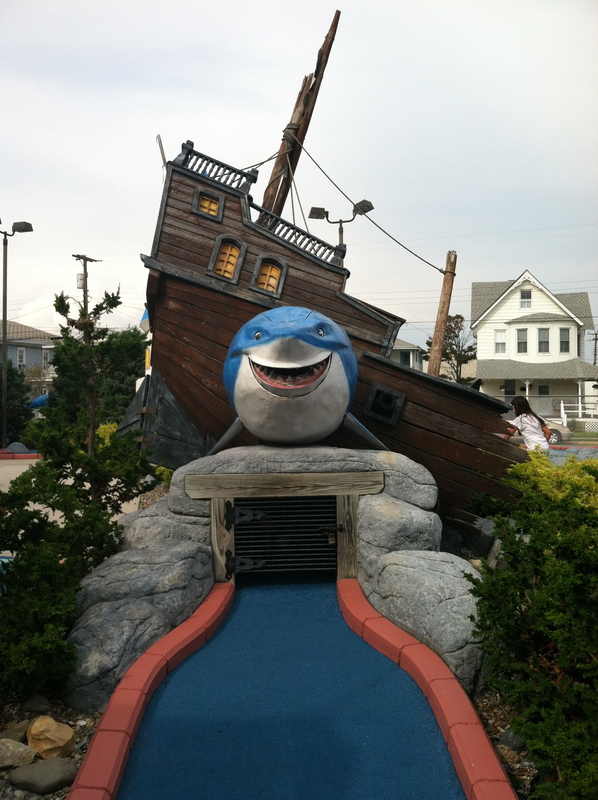 The final hole at Duffer’s in New Jersey that features an animatronic shark sticks out in my mind visually. 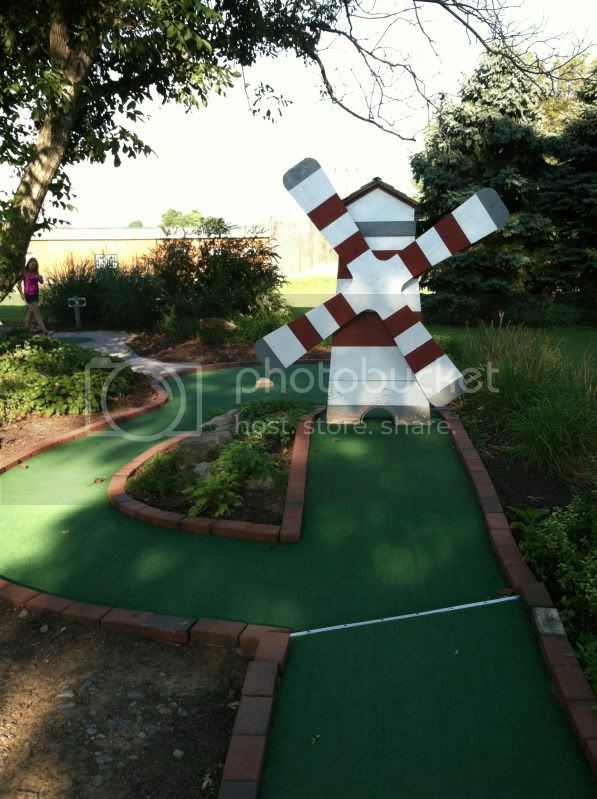 The concept behind the final hole at Big Stone Mini Golf in Mound, MN is brilliant. 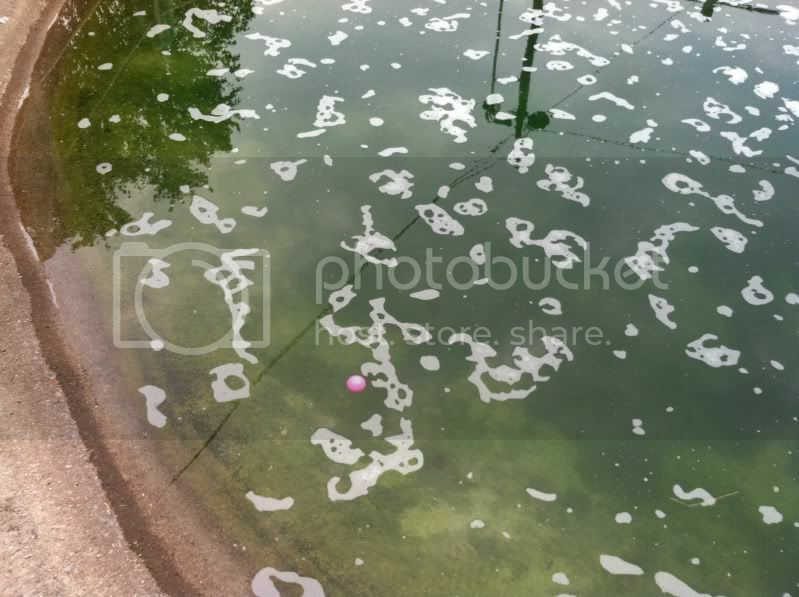 The ball slowly moves down a path of water to it’s final resting place. All of these holes are very different but conceptually and visually stood out in my mind. I always seem to remember the holes where I score a hole-in-one. The coolest hole I played this summer was Hole 2 at Barnyard Swing in Cooperstown, NY. Instead of playing the green, you have the option to hit the ball right into the course’s river. The water flow moves the ball down a couple feet to a metal grate, which directs the ball back onto the putting green with optimal chances for a hole-in-one (which I did get!). 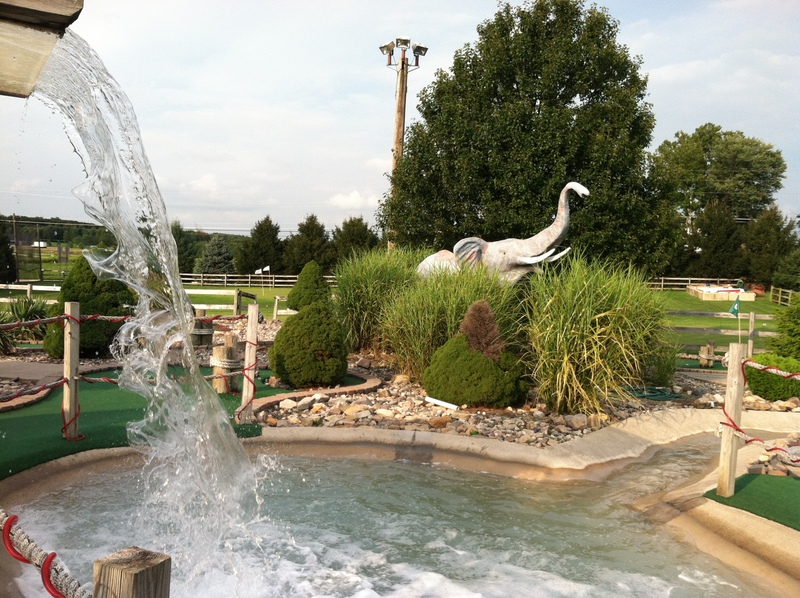 Since Barnyard Swing, we’ve encountered 3 or 4 holes just like it at other courses in PA and NJ. 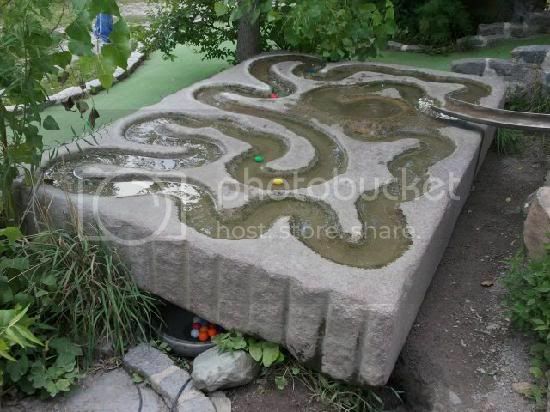 Another one of my favorites is The Spiral at Big Stone Mini Golf . The entire green forms a giant spiral surrounded by sunflowers, so you can’t see where the hole is until you work your way to the middle. 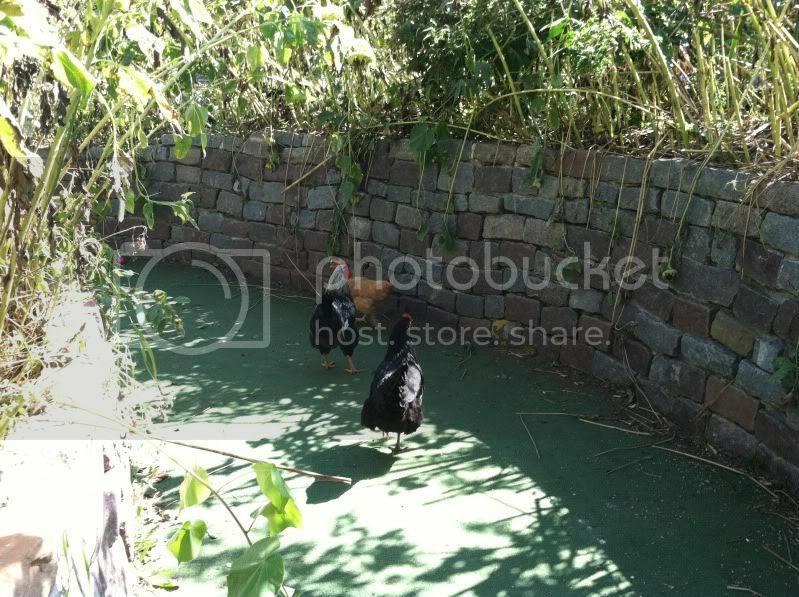 This one is also unique because there are often live chickens and roosters running through the flowers and onto the putting green- not something you see at every mini golf course. 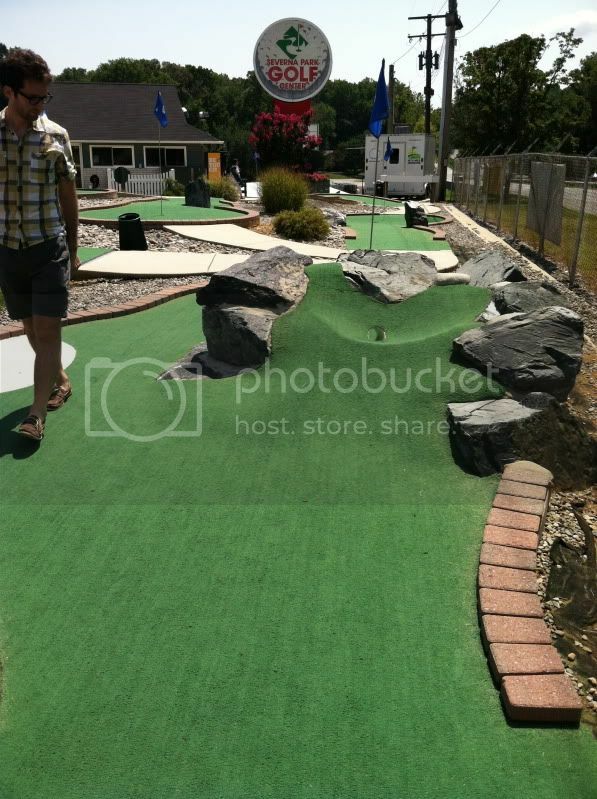 You have more or less a 5 star rating system, but what criteria do you look for in a good mini golf course? I like unique holes or courses where all aspects of the design are well executed. We run into courses that are poorly maintained or they look nice but make for boring play all the time. You can tell which courses consider all aspects of the experience whether it’s a net to recover your ball from a larger water hazard or unique signage for each hole that is related to the actual play of the hole. For me it’s often about the details. Signage, overarching themes, waterfalls and rivers, ice cream and creative scorecards, just to name a few. But I agree with Tom – the course has to be well-maintained in addition to having a unique variety of plays. I think that most mini golf goers enjoy that kitsch factor. 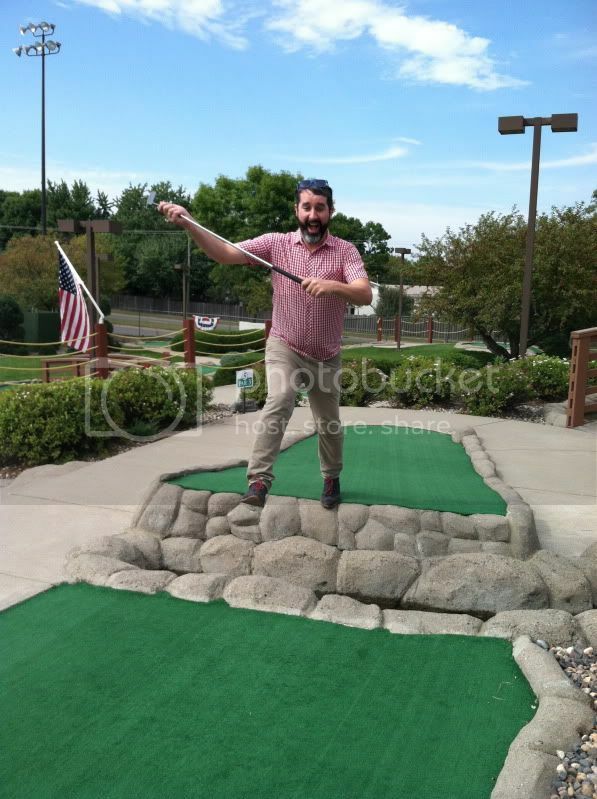 Are there other ‘aesthetics’ for mini golf? I appreciate courses that have less of a “real golf” feel. Numerous courses try to be a miniature version of a golf course. There are some cases in which it is pulled off so well and the play is challenging that can make the play and overall experience worthwhile. Unfortunately, there are many courses end up resembling the more stuffy and less engaging elements of your average golf course. It’s no surprise that a lot of those types of courses also include golf pro shops and driving ranges. 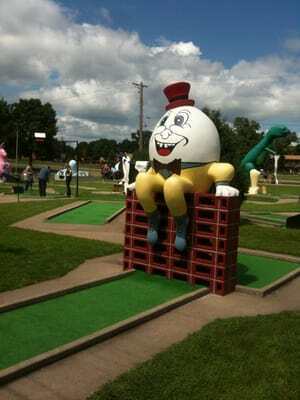 I respect the game of golf but the reason I like mini-golf is that it more inclusive. 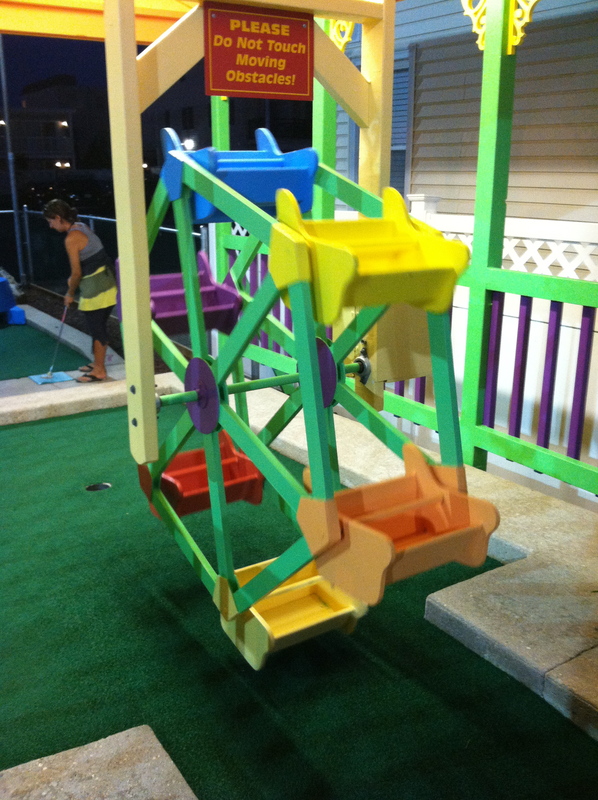 It’s inexpensive to play but more importantly, mini-golf accommodates all ages and levels of play. Can we talk about animatronics? Many courses use motors for moving parts (windmills, doors, ferris wheels, etc.). As far as animatronics that move and talk, we’ve only really found these at the very touristy courses where there is a lot of local competition. Duffer’s has a crew of singing pelicans that greet you at the entrance, as well as a giant shark on the 19th hole. But the animatronics we’ve encountered just add decoration rather than interfere with the play of the hole. Are there themes, concepts or obstacles that are popular on a national level? Dinosaurs? Black light? Sand traps? Castles? There are a lot of localized themes. For example, Melody Lakes Golf in Pennsylvania had many dutch country elements. Courses at the Jersey Shore had elements related to the beach (lighthouses, fish) and the boardwalk. 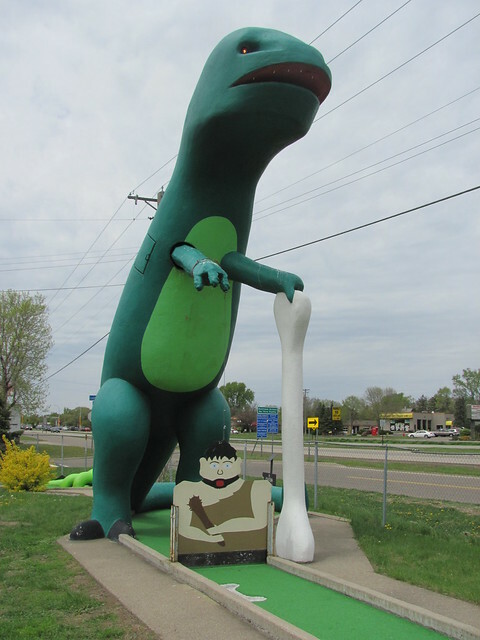 Also, kid-friendly themes like animals, pirates, dinosaurs, nursery rhymes, castles, dragons and did we mention dinosaurs? 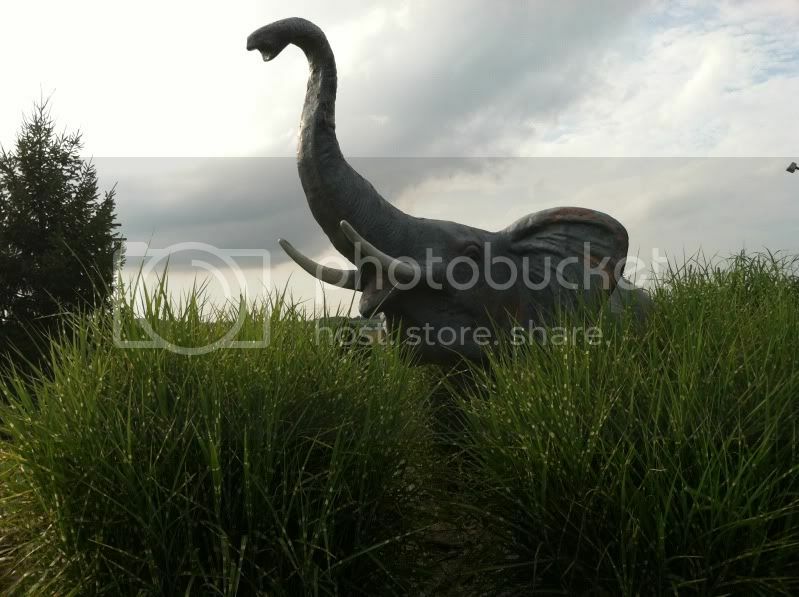 Popular themes in mini-golf follow common amusement park themes that would appeal to children. There are some common concepts courses follow. There are golf-like, black light, tournament style, kid friendly and of course, artist-designed. Common sets of obstacles dot almost any course. Common obstacles are sand traps, water hazards, windmills, bridges, loop de loops, waterfalls, pipe play, ramps, jumps, hilly terrain, motorized hazards, rocks and fiberglass figures. Artist-designed mini golf has come a long way since Walker’s 2004 course, what happens when artists and designers enter this traditionally kitsch territory? The intersection of artists/designers with mini-golf is very exciting. It offers a fresh approach to a realm that can be a bit conservative and repetitive at times. Different elements of kitsch can be brought in to update your standard windmill, loop de loop or bridge. Are these playable, or do they just look cool? I think it’s still a mix of both. There are certainly artist designed holes that are super successful in terms of playability and creativity. However, there are still many that would never make it in a commercial course due to a lack of practicality and durability. Problems arise when the play is not considered at all. The basic premise of moving a ball from a starting point to a hole has to remain in the back of the mind of the artist or designer. What are pitfalls for design? Does Design with a capital ‘D’ ever compromise playability? Design can comprises play and complicate the experience. A hole can be challenging and involve a lot of steps but it shouldn’t be confusing. One should know where each hole begins and ends. Fashion over function shouldn’t result in the lack of a hole or design flaws that prevent the possibility of getting the ball in the hole. We’ve played some holes designed by architects at the National Building Museum course. While they were certainly unique, abstract and aesthetically interesting, many of them just didn’t play well. Surface has a lot to do with this. One hole was a fiberglass labyrinth. It’s surface was so smooth that the ball wouldn’t stop rolling, making it impossible to score under par. Another hole was comprised of hundreds of small wood blocks cut at different heights with tiny gaps between them, which made for a highly irregular and uneven surface. 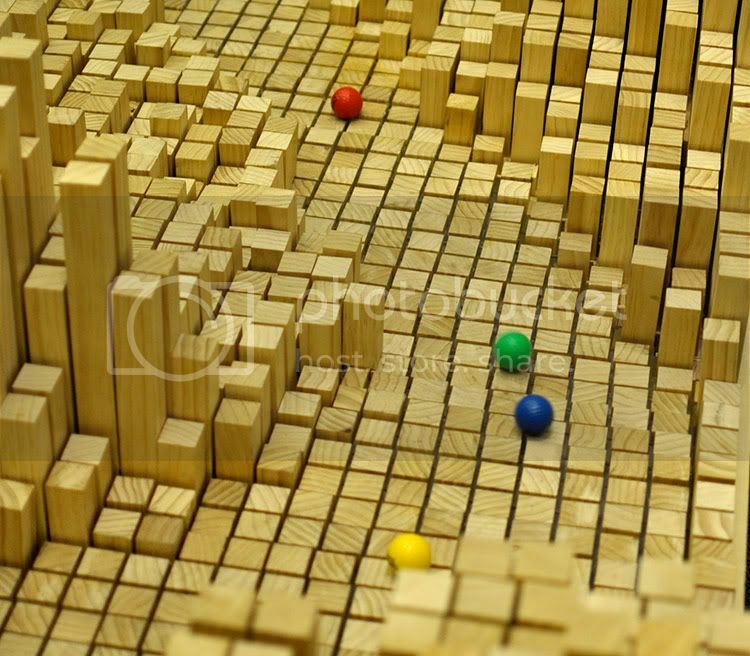 Sometimes the ball would just stop between gaps and you couldn’t get it to roll smoothly. Are there identifiably ‘bad holes’? Absolutely. The worst and most unforgivable holes are the ones that are maintained so poorly that it actually affects the play. 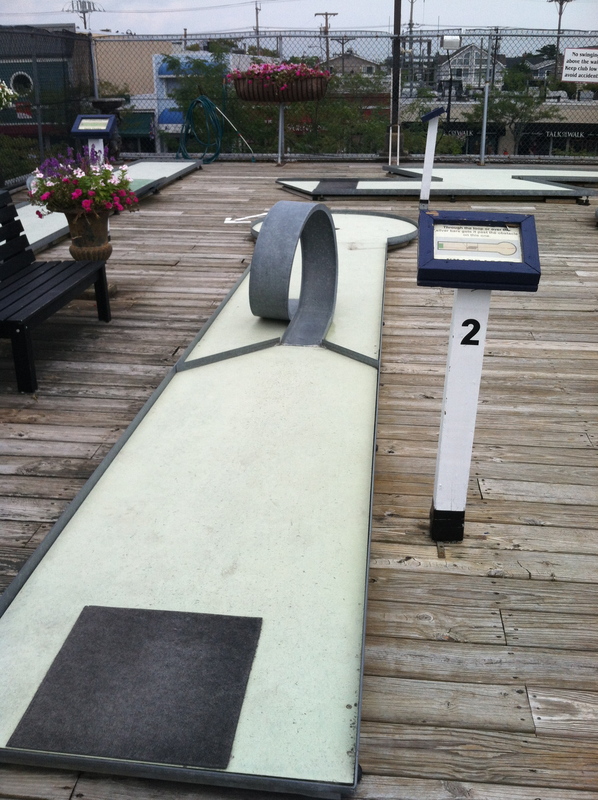 Mini-golf’s popularity has waned which has made it less profitable than it has been in the past. There are a number of elements like motors that move water or turf that are not cheap to begin with and require money to maintain function and play. We’ve come across many non-functioning windmills, mangled greens and sloppy sand traps that negatively affect the overall experience. There have been a number of courses that had greens with multiple hole options but no rules or directions as to which one is the “right” hole. This always seems arbitrary, unnecessary and makes for confusing play. Do you have advice for artists proposing holes? What are your recommendations for courses MN artists should visit for inspiration? Play local if you can or search online there are a ton of resources. One of the courses that Robin and I are looking forward to playing down the road is Par-King (http://www.par-king.com/). It’s considered one of the best courses in the country and you can view videos on their site of how the course works. Locally, you can take a look at indoor courses in Chaska and the Mall of America or play outdoors at Goony Golf in Columbia Heights or Big Stone in Mound. Big Stone is the best of the lot and Goony Golf has three different courses with a variety of types of holes. Overall, find a good balance between creativity, practicality and fun play for players of varying skill levels. 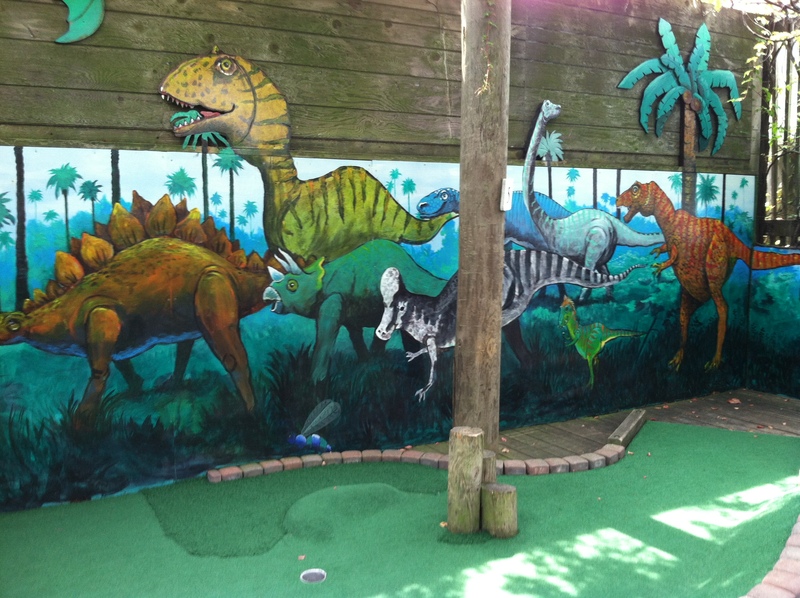 I’ve done some extensive internet searches for artist-designed mini golf courses. Because many of them are temporary, I haven’t personally gotten to play them. However, it is always inspiring to look at photos and watch videos online!